For Mass production, MOQ is 100pcs 2. What's your Lead time9 A: For samples, lead time is 1-2days. For mass production, lead time is 2-5days. 3. What's your price9 A: Price base on LED Color and Qty, please send us inquiry with details. 7. speed: 1~8 grades 8. brightness: 1~8 grades 9. display mode: 6 types ( from right to left, from up to down, from down to up, stop, flashing and scrolling, flashing etc). 12. operation: edit via key button or USB 13. rear cover provide protection to the back 14. with a small drawer to save the battery 15. attach to the cloth via two strong magnets or small hook. 16. input: graphic and multielement input 17. packing: standard box / blister pack &clubs;Our service 1. Your inquiry related to our products or price will be replied in 24 hours 2. Diverse models, dimension and design of LED display for customer selection, 3. Protection of your ideas of design and all your private information. 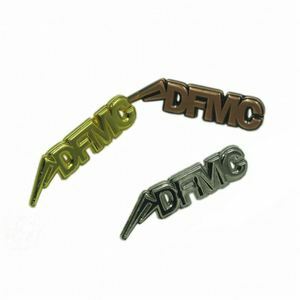 Our customized lapel pins can be manufactured in any shapes, sizes, colors and logo designs . Products are exported to Europe,Japan America, Southeast Asia and other countries . The purpose of our service is the best quality, best price and good reputation Bode customers. Specifications led name board Taking on the upper clothes, t-shirts. Red/Yellow/Blue/Green/White 3X1.3inches LANPAI Factory Best Price Rechargeable Battery Scroll Text Display Mini scrolling led name badge Usage Taking on the upper clothes, t-shirts. Max input letters (Western) 1,500 characters Max input letters (Oriental) 750 characters Max. 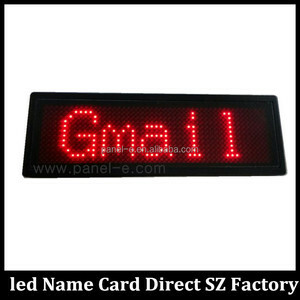 Specifications distintivo portato LED name badge, LED mini board, LED display board, LED sign, LED sign broad, LED cigarette stand, LED acrylic stand, LED price tag led message signs Put on our LED badge on your clothes, good for any event, off-line product promotion, trade show, fair, exhibition, election campaign etc. Our LED badge can be used repeatedly by rechargeable battery inside and easy to input your own designed text & image by USB from PC program, thin and light weight !! 1. Material checking: strictly control of material using, meet international requested standards; 2. semi-finished products inspection: product inspection before 100% finished ; 3. production line test: with work team or data engineer who will inspect matchines and lines at fixed period. payment will be taken untill you confrim the goods received in good condition. Why Choose Us: Related products: Amoonsky Technology focused on led video processor also led display control solutions matching products production. We aimed at improve business of our customer Factory Information: Contact us: I am Stella glad to be your professional led display control solution consultant~ Anything i can do for help please feel free to contact me as below. 2(two) IMAGE messages (max 12 x 512 pixels), it can use this input Hindi, Thai, Logo, etc. 11) With 2 key on board, easy to select run sequence of 6 messages and set brightness. 13) 10 twinkle pictures in common use which is embedded inside our led name badge. The malfunction and damaged caused by incorrect use, the unauthorized repairs and alteration. B. The product malfunction caused by the fall and transportation failures after purchase. D. The product malfunction caused by Not in accordance with the user manual operation. E.
7. speed: 1~8 grades 8. brightness: 1~8 grades 9. display mode: 6 types ( from right to left, from up to down, from down to up, stop, flashing and scrolling, flashing etc). 12. operation: edit via key button or USB 13. rear cover provide protection to the back 14. with a small drawer to save the battery 15. attach to the cloth via two strong magnets or small hook. 4. (Top Quality) + (Reasonable Price) + (Responsible After Service) = (Successful & Win) &clubs;Warm Tip: There is DIP, SMD, and Dotmatrix led displays for customer choosing. Display mode: Scroll, Hold, snow, flash Power: 100~220V AC Input, DC 5V / 400 mA Output Technical Parameters: Pixel resolution 12X48 pixels Frame Material ABS N.W 40g G. Display languages World language,such as English, Simplified Chinese, Traditional Chinese, Korean, Japanese, Russian, and all European countries language; Display ability 8 message for text or picture,english, 6000 chars or chinese 3000 chars. Brightness 4 different levels,25%,50%,75%,100% Speed 8 different levels by pc software Function Program the customers own message easily through the led badge software by pc Key switch brightness key for 25%,50%,75%,100%. The Led Name badge --- Special and Unique Functions Colors :Red / Green / Blue / Yellow The Unique Advantages : )The unique :No Need Driver, No need CD and do not worry lost the Software )The unique : High capacity battery of 300MAH,and working 20Hours )The unique : USB Charger Line same with Mobile (Android System) ) Software HDSmart setting more animations ,photos and Texts )The unique :Support Temperature directly )All language Size 94 X 30.3 X 7mm, Pixel 11 Height *44 Width Nametag colors Red,Green,Blue,Yellow,White,Purple Communication port USB Micro. Same with mobile port (Android), no need Drive The batter Capacity Lithium battery 300MAH The charge time 1.5 Hours The charger specifications 5V,500MHA( Same with Mobile Charger) Working time Continue working 20 hours Support Languages All languages Software Interface Language Chinese, English, Farsi , Turkey, Russia, French, Germany, Thailand, Mongolian, Poland, Korea, Spanish, Vietnam ,Japanese total 13 software interface languages Programs 10 Programs and total 32KByte Showing effects Text, Animation,photo, Temperature Brightness adjust 5 Levels ( longer- click the button adjusting ) Wear modes Brooch and magnet Software HDSmart (When insert the USB lines, it will show in the HardDisk) Packing details 1PCS led nametag+ 1pcs Charger + 1PCS USB Micro Charger line Note : 1) This Item Including 6PCS Red colors 2) For other colors like Blue / Green / Yellow of USD 98.5/ 6pcs (Blue / Green / Yellow color can be Mix together) 1.Packing list 1) 6PCS led name badge 2) 6PCS USB charge lines 2. Different colors and size. Type Color Size Pixel Width * Height HD-NT48R Red 94 X 30.3 X 7mm 44*11 HD-NT48G Green 94 X 30.3 X 7mm 44*11 HD-NT48B Blue 94 X 30.3 X 7mm 44*11 HD-NT48Y Yellow 94 X 30.3 X 7mm 44*11 HD-NT48W White 94 X 30.3 X 7mm 44*11 HD-NT48P Purple 94 X 30.3 X 7mm 44*11 3. Operate ways The software of HDSmart been inside name badge ,when Insert the USB lines ,it will come out Software automatically in Harddisk. 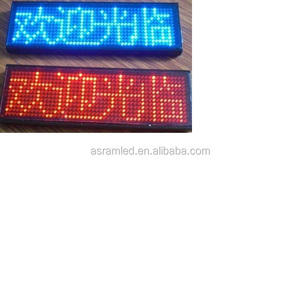 Alibaba.com offers 416 led text badge products. About 1% of these are badges, 1% are metal crafts, and 1% are other gifts & crafts. 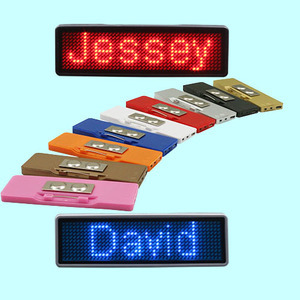 A wide variety of led text badge options are available to you, such as magnetic, led flashing, and nickel-free. 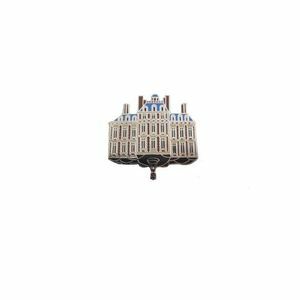 You can also choose from metal, plastic, and rubber. As well as from pin on, button on. And whether led text badge is paid samples, or free samples. There are 335 led text badge suppliers, mainly located in Asia. The top supplying country is China (Mainland), which supply 100% of led text badge respectively. 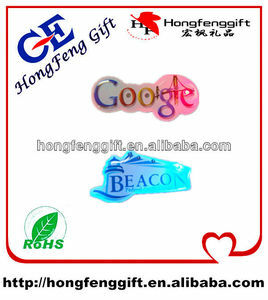 Led text badge products are most popular in Eastern Europe, Domestic Market, and North America. You can ensure product safety by selecting from certified suppliers, including 63 with ISO9001, 52 with ISO14001, and 7 with BSCI certification.